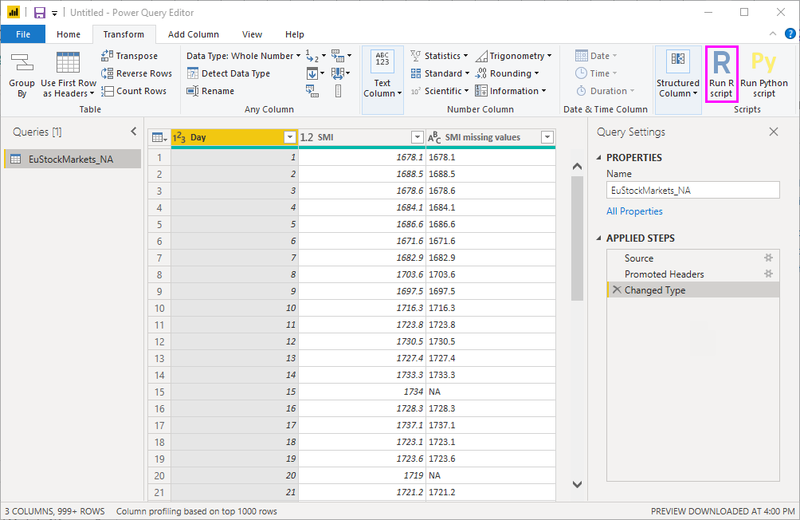 You can use R, a programming language widely used by statisticians, data scientists, and data analysts, in the Power BI Desktop Query Editor. This integration of R into Query Editor lets you perform data cleansing using R, and perform advanced data shaping and analytics in datasets, including completion of missing data, predictions, and clustering, just to name a few. R is a powerful language, and can be used in Query Editor to prepare your data model and create reports. To use R in Power BI Desktop's Query Editor, you need to install R on your local machine. You can download and install R for free from many locations, including the Revolution Open download page, and the CRAN Repository. 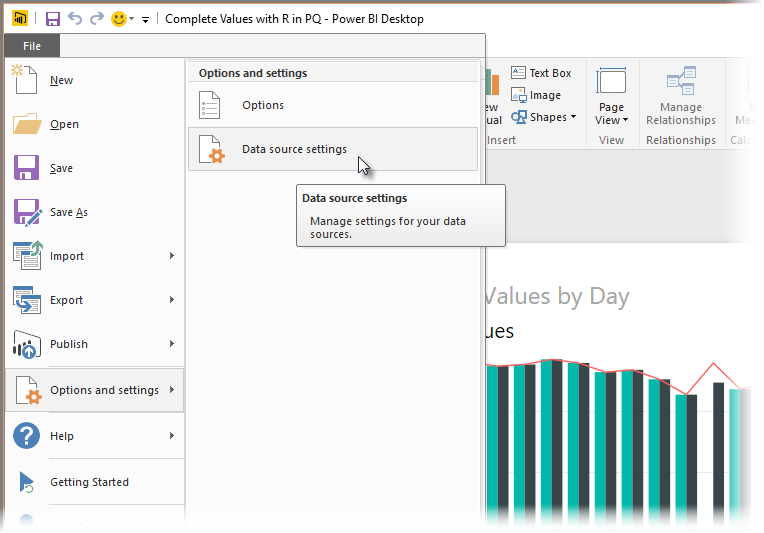 First, load your data into Power BI Desktop. 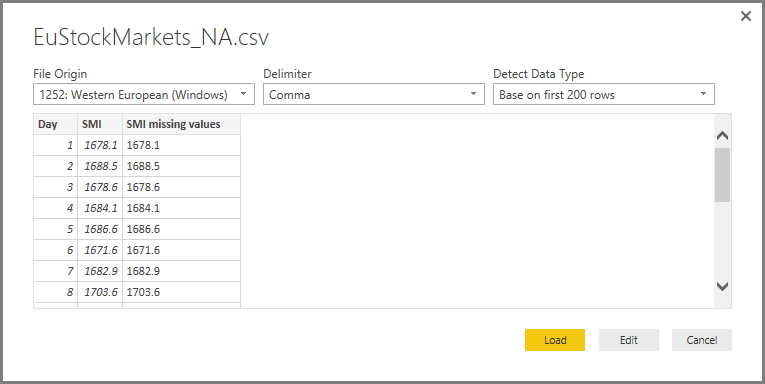 In this example, load the EuStockMarkets_NA.csv file and select Get Data > CSV from the Home ribbon in Power BI Desktop. 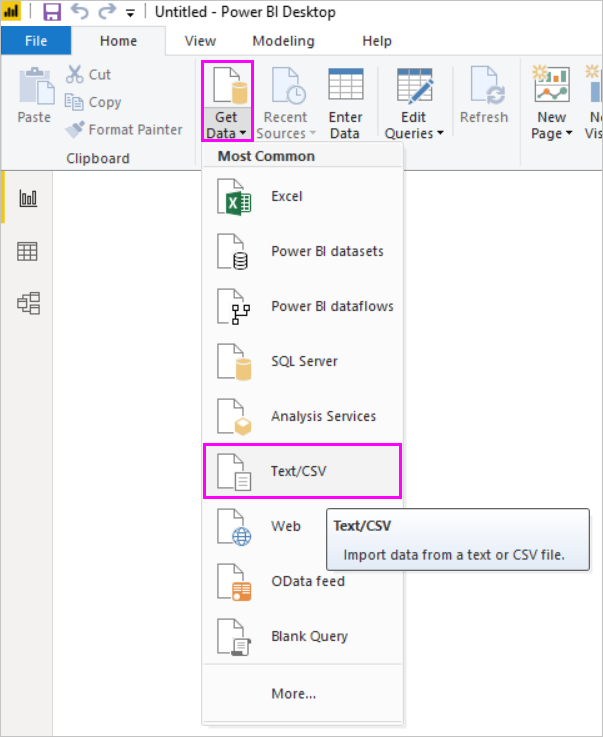 Select the file and select Open, and the CSV is displayed in the CSV file dialog. 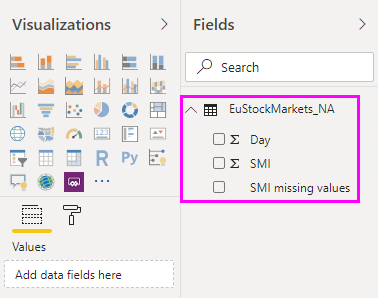 Once the data is loaded, you'll see it in the Fields pane in Power BI Desktop. 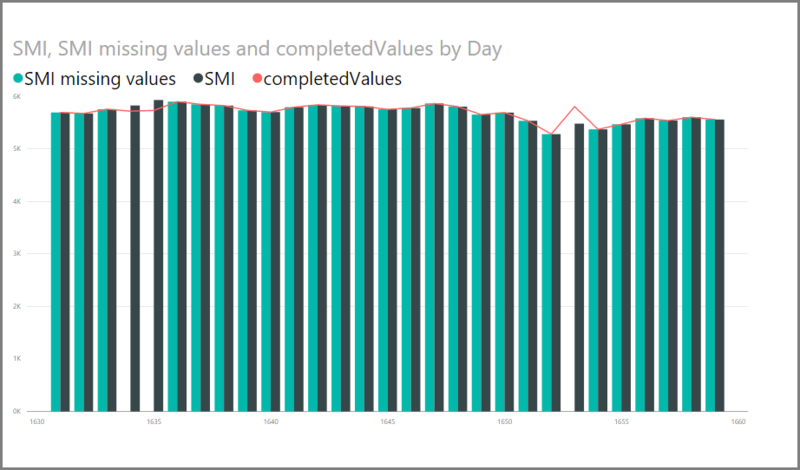 Open Query Editor by selecting Edit Queries from the Home tab in Power BI Desktop. In the Transform tab, select Run R Script and the Run R Script editor appears (shown in the next step). Notice that rows 15 and 20 suffer from missing data, as do other rows you can't see in the following image. The steps below show how R can (and will) complete those rows for you. output$completedValues <- completedData$"SMI missing values"
After selecting OK, Query Editor displays a warning about data privacy. 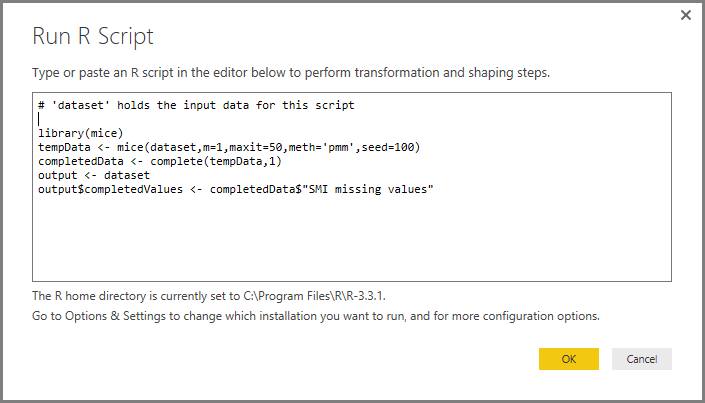 For the R scripts to work properly in the Power BI service, all data sources need to be set to public. For more information about privacy settings and their implications, see Privacy Levels. Notice a new column in the Fields pane called completedValues. Notice there are a few missing data elements, such as on row 15 and 18. Take a look at how R handles that in the next section. With just five lines of R script, Query Editor filled in the missing values with a predictive model. Once that visual is complete, and any other visuals you might want to create using Power BI Desktop, you can save the Power BI Desktop file (which saves as a .pbix file) and then use the data model, including the R scripts that are part of it, in the Power BI service. Want to see a completed .pbix file with these steps completed? You're in luck - you can download the completed Power BI Desktop file used in these examples right here. Enable scheduled refresh for the dataset - to enable scheduled refresh for the workbook that contains your dataset with R scripts, see Configuring scheduled refresh, which also includes information about Personal Gateway. Install the Personal Gateway - you need a Personal Gateway installed on the machine where the file is located, and where R is installed; the Power BI service must access that workbook and re-render any updated visuals. You can get more information on how to install and configure Personal Gateway. All R data source settings must be set to Public, and all other steps in a query created in Query Editor must also be public. 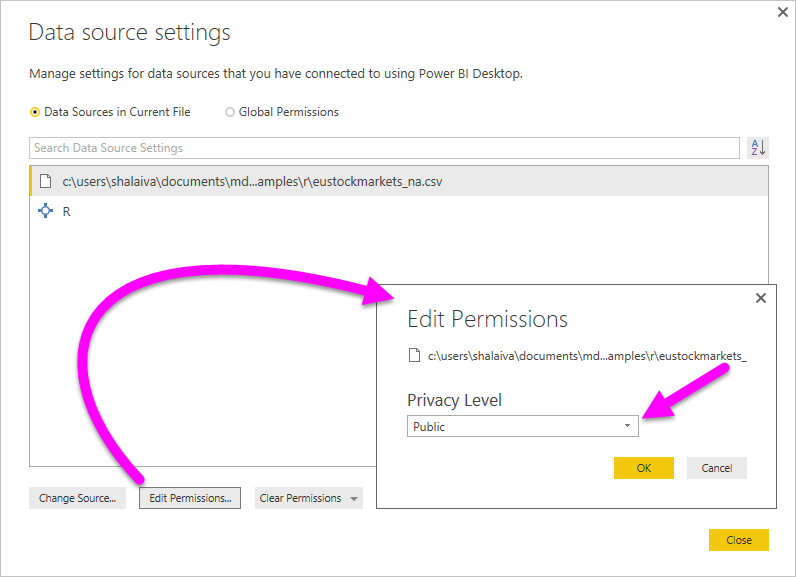 To get to data source settings, in Power BI Desktop select File > Options and settings > Data source settings. From the Data Source Settings dialog, select the data source(s) and then select Edit Permissions... and ensure that the Privacy Level is set to Public. To enable scheduled refresh of your R visuals or dataset, you need to enable Scheduled refresh and have a Personal Gateway installed on the computer that houses the workbook and the R installation. For more information on both, see the previous section in this article, which provides links to learn more about each. There are all sorts of things you can do with R and custom queries, so explore and shape your data just the way you want it to appear.